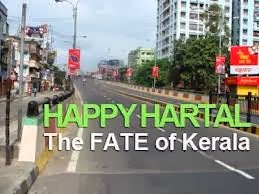 Sameer Ansar Writes: Hartal in Kerala. While travelling or holidaying in Kerala, it is important to know that there is such a thing called "HARTAL" that can happen unexpectedly. These Hartals are politically enforced holidays that punish the common people to stay indoors for a day. Most people residing in Kerala have come to terms with this crazy manner of declaring a Hartal at the smallest excuse. The working class plan immediately on how to spend the (holi)day that they have got. They buy a bottle of booze and good food and get set to either spend a day in front of the TV and party or with their family - eating and sleeping well. The businessmen curse these hartals as it means excessive losses and plot different ways on how they can get their staff to office. Since hartals do not allow cars to ply the roads, the business men plan ingenious ways to get staff to office by either hiring an ambulance to ferry staff or starting office at 6 a.m etc. The office shutters are downed and work goes on inside. 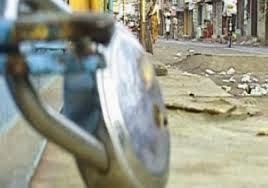 If the hartal announcers find that people are working on a hartal day, then its hell for them. People with weddings planned suddenly find that guests excuse themselves. Food goes waste and the event becomes a sad affair. Young graduates ready for their first interview suddenly lose all hope. Students who have prepared for exams are happy since they get an extra day to prepare. So if you find yourself in the state of Kerala a day before a Hartal is announced, here a re a few tips. 2. Ensure food supplies in plenty. Hartal means no shops, no hotels or restaurants. So ensure that you have readied yourself with needed supplies like Bread, milk, eggs etc the day before. 3. Ensure water supply for drinking in advance. 5. Ensure that entertainment options are readied. Either have a television or books to read etc.